I think it’s an attempt at a kiss. It’s wet and slimy and really sweet. Whatever it is, it leaves my entire face covered in baby dribble. That dribble gets everywhere. And so, after the constant mouth/nose/entire face wiping that has made up the majority of this week, I decided something needed to be done. Hence the dribble catcher. 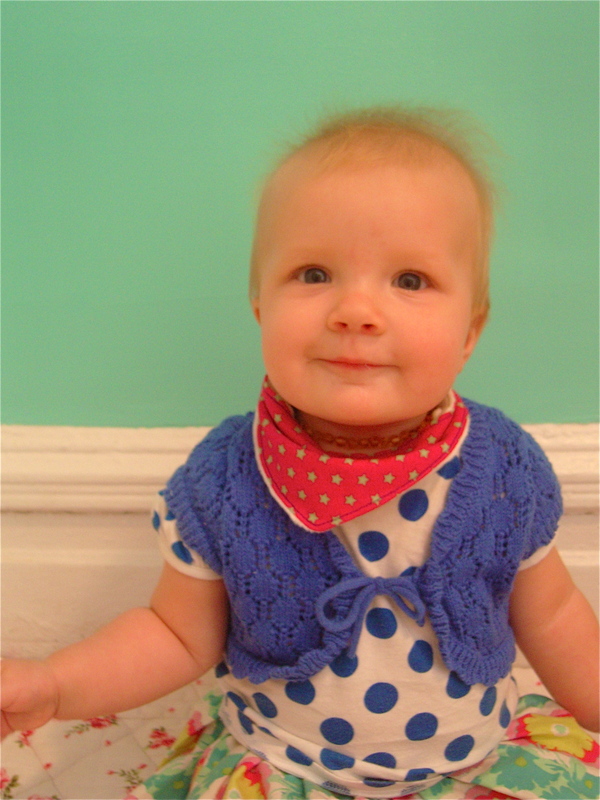 It’s essentially a baby neckerchief designed to catch and absorb the ridiculous amount of dribble that leaves said baby’s mouth over the course of the day. I’ve seen them in the shops, but I’m always a sucker for ‘I could make that at half the price’ comments, so you guessed it, I’ve gone ahead and made my own. 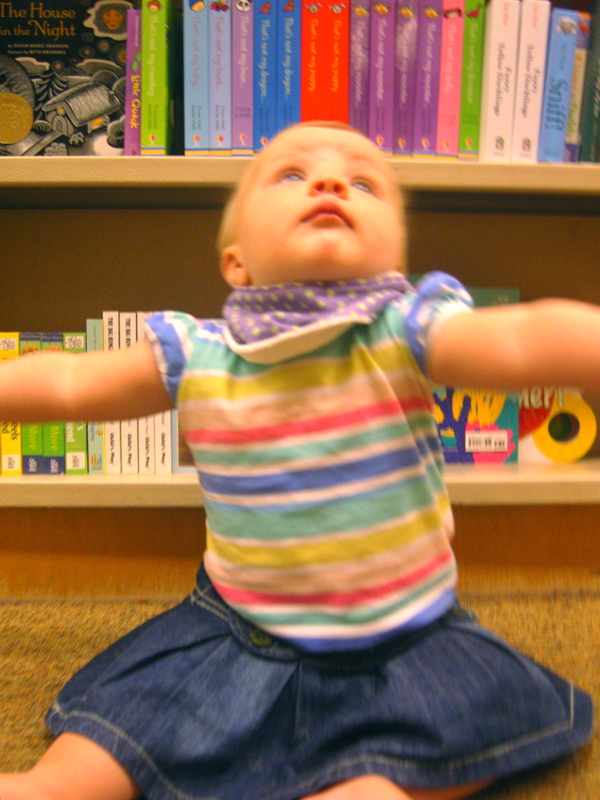 Not only that, but I’ve written a tutorial too, so you can partake in the baby-dribble-catching-making-phenomenon. 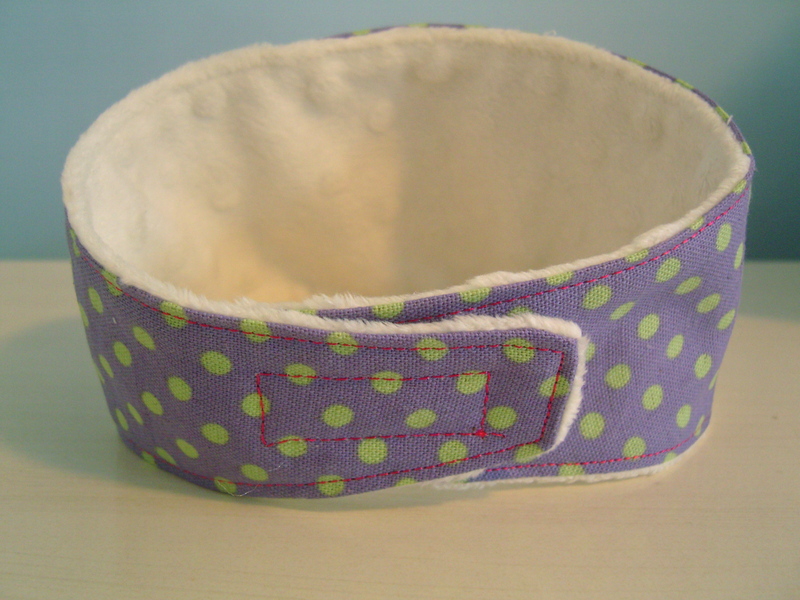 Perfect for new baby gifts or to cheer up the parents of a grizzly teether. 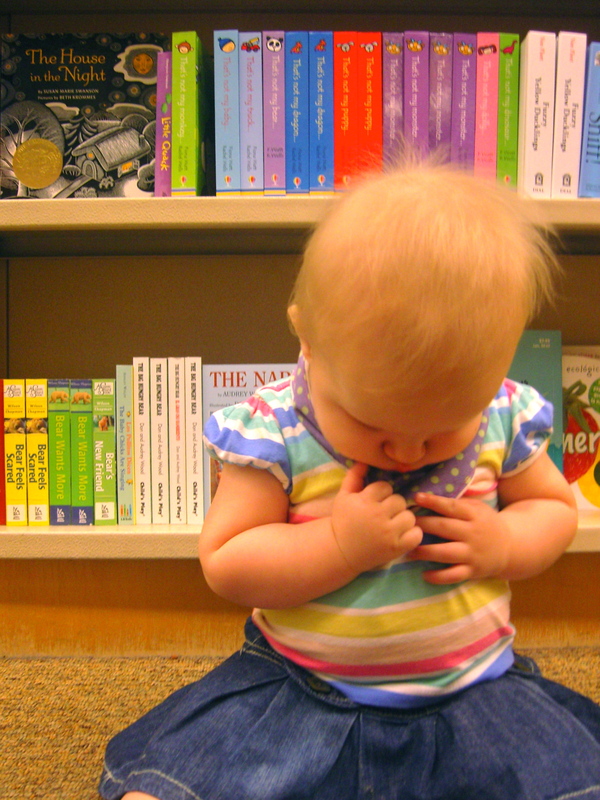 Molly certainly wasn’t sure what to make of it at first…! 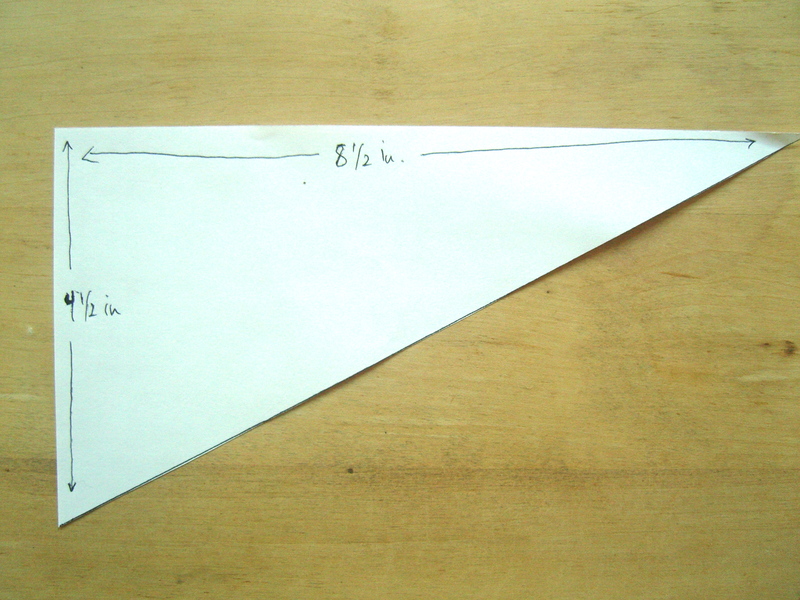 Before we begin I must add that my initial pattern was a guess…. and not entirely correct (I’ll show you what I mean a bit later). 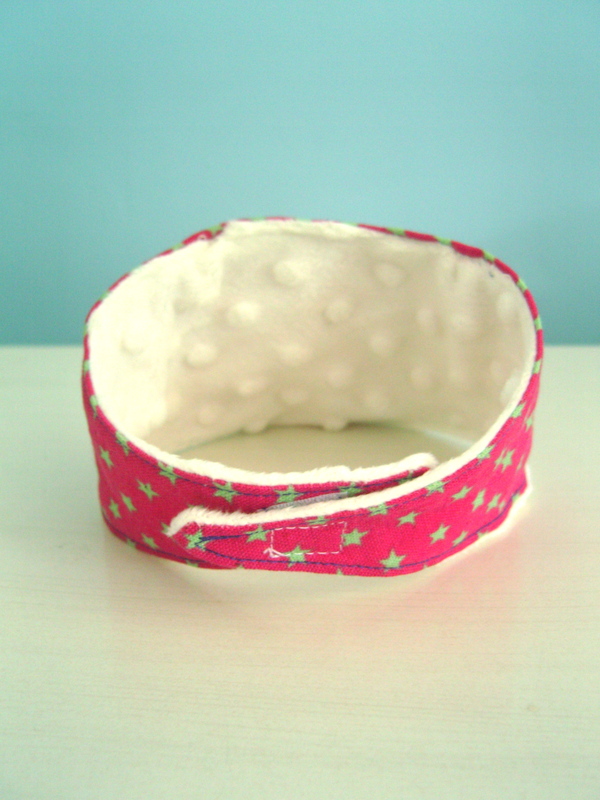 Unfortunately I took all the photos for the tutorial whilst doing this one, so you’ll just have to use your noggin’ a bit and follow the steps for the purple one (but you’ll be using a different pattern) in order to get a pink looking one. Simple! 🙂 I’ll talk you through it, so just follow the steps and you should be fine. It’s really very easy. 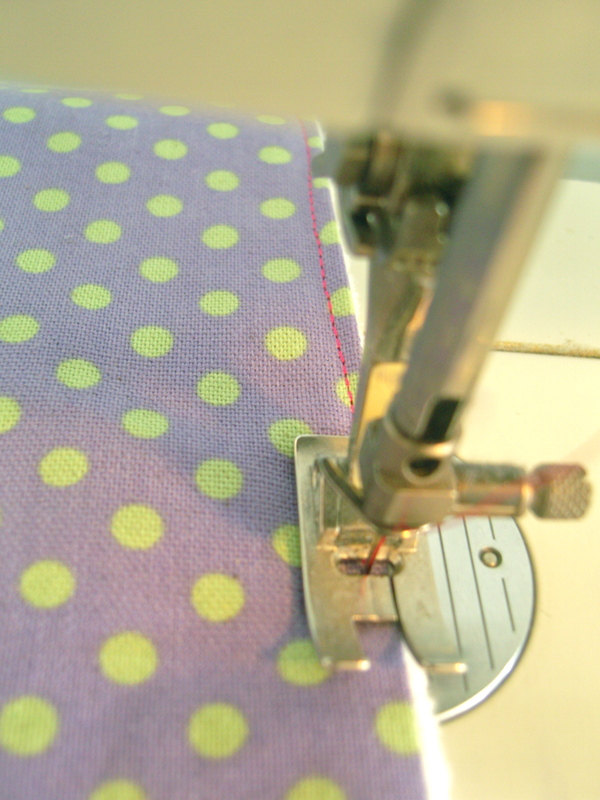 Sewing tools such as a sewing machine (although probably manageable without), scissors, thread, ruler etc. 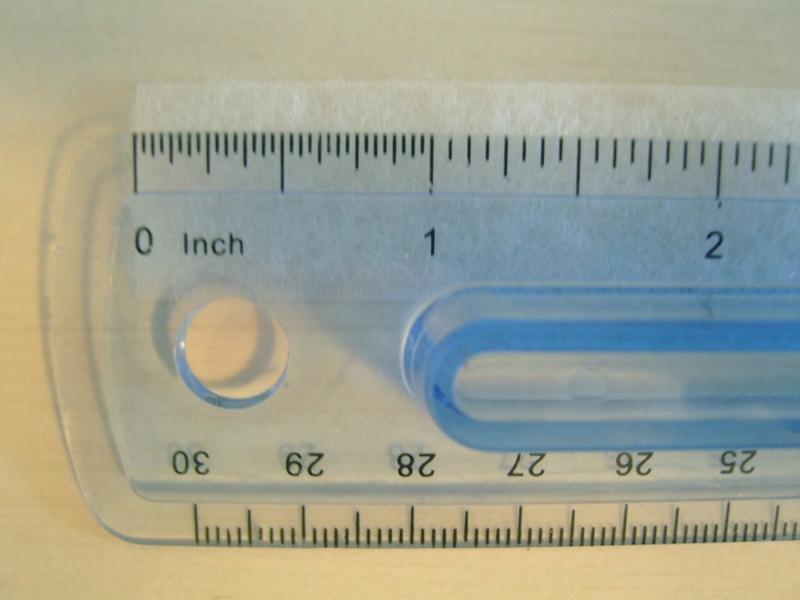 The dimensions are 4 1/2 inches by 8 1/2 inches. As you will see with the purple one, I initially made the back thicker, but it was just far too thick, so this is why you need to make it as a triangle. SO from here on in, you’ll see the dribble catcher being made with a different pattern. But stick to the one you see above. 2. 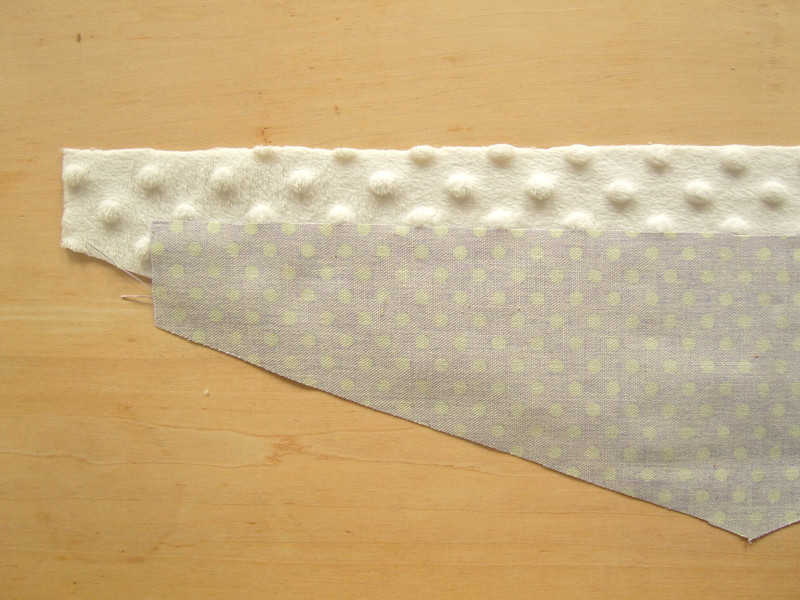 Lay your pattern over fabric that has been folded in half. 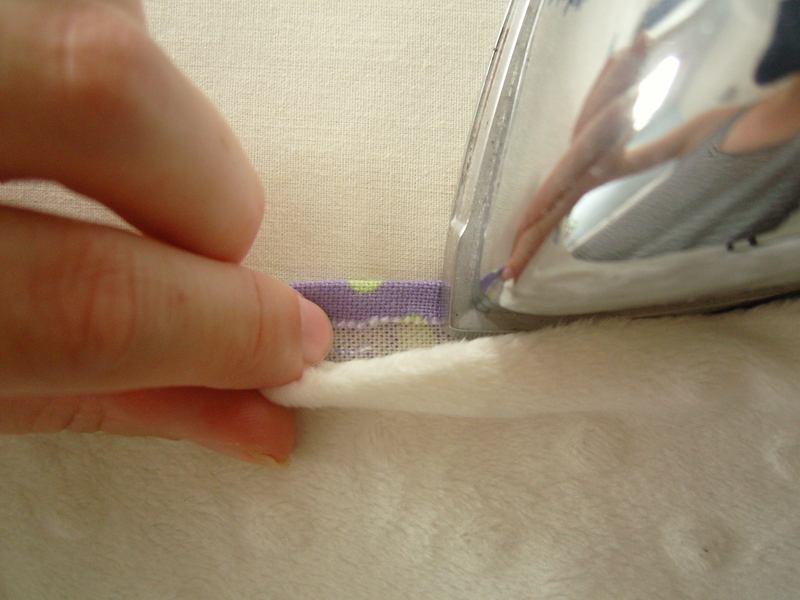 The longest side (the middle of the dribble catcher) needs to line up with the fold in the fabric so than when it is opened out you have one piece. Do this for both of the fabrics. 3. 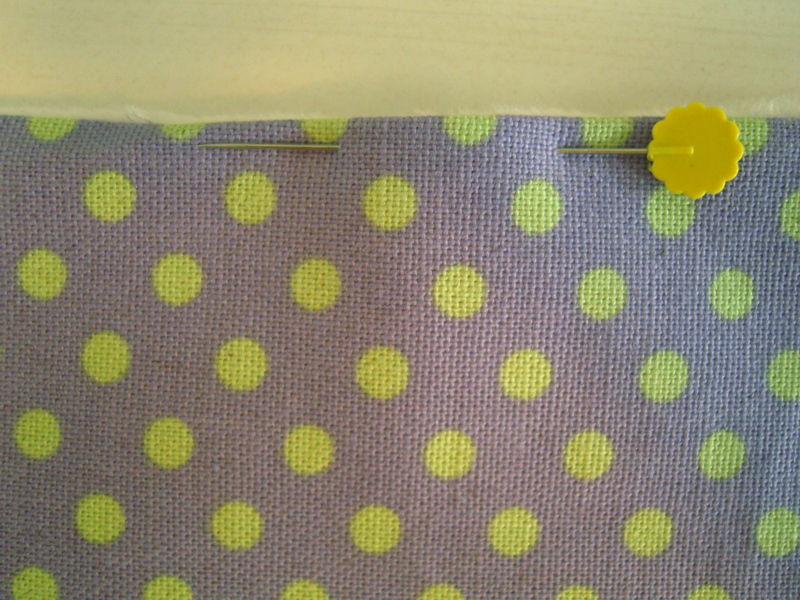 Pin the two fabrics RIGHT sides together. 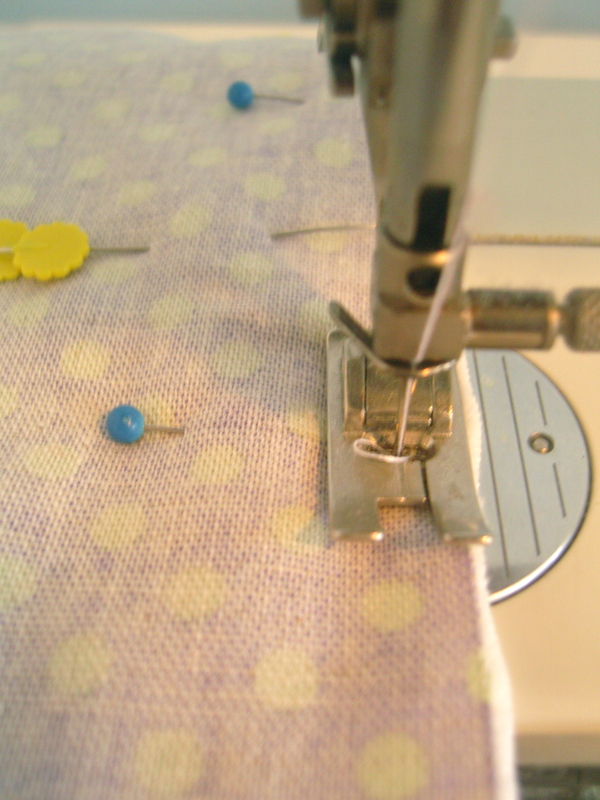 I like to use quilting pins as they are longer and tend to make the fabric more stable when sewing. 4. 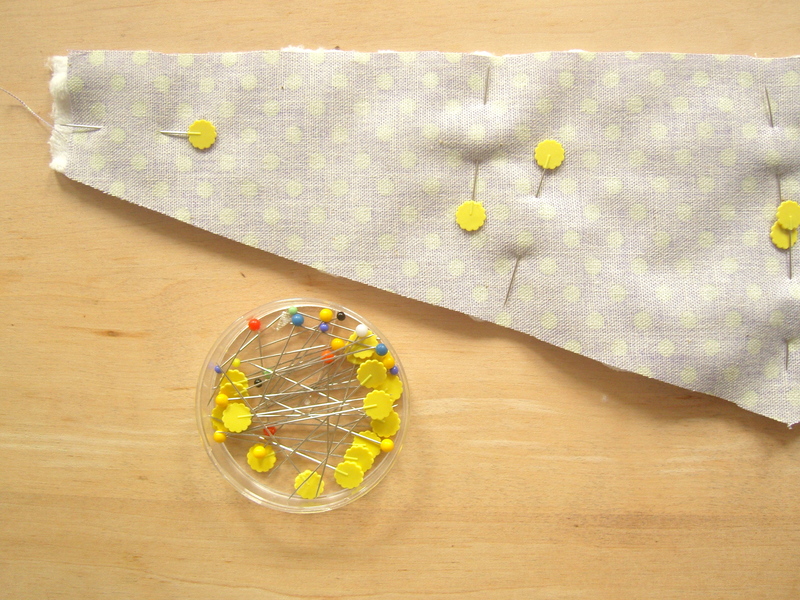 Use 2 different coloured pins to make the entry point. 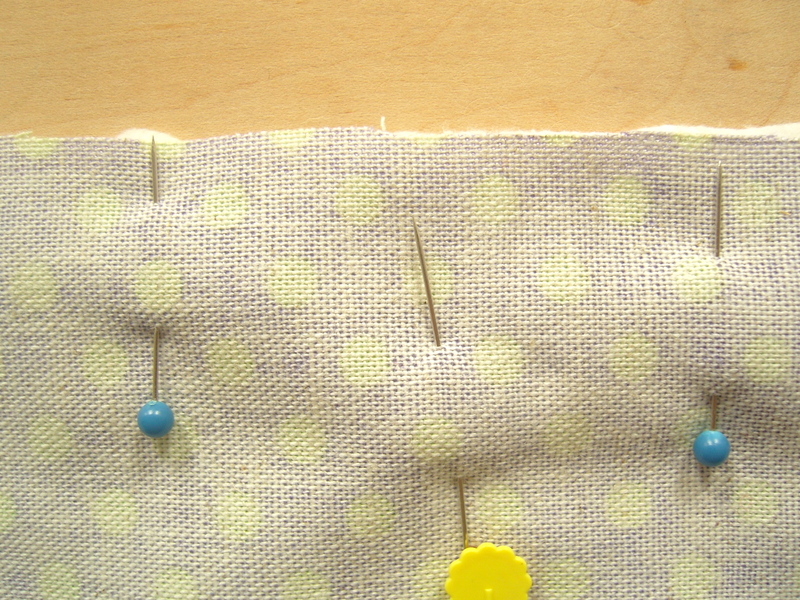 You will NOT sew between these two pins. 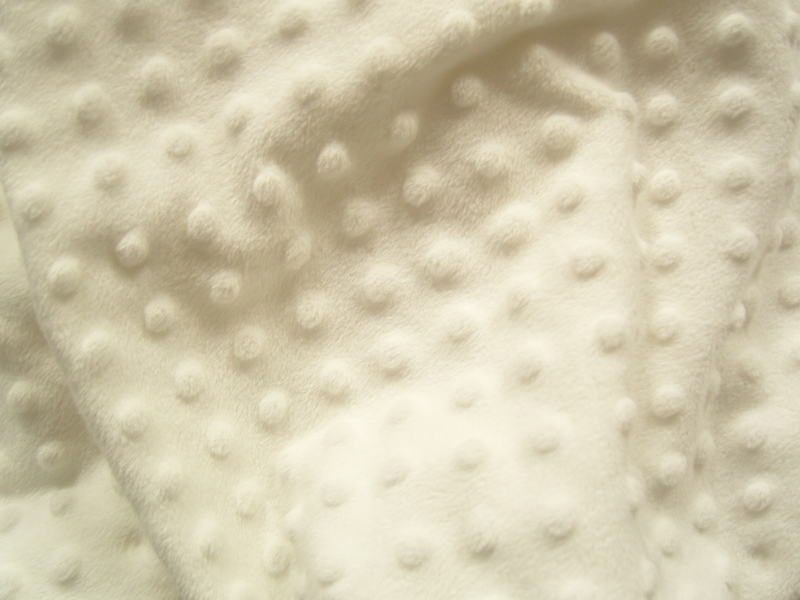 This is the point that will be used to turn the fabric right sides out. This needs to be about 2 inches. 5. 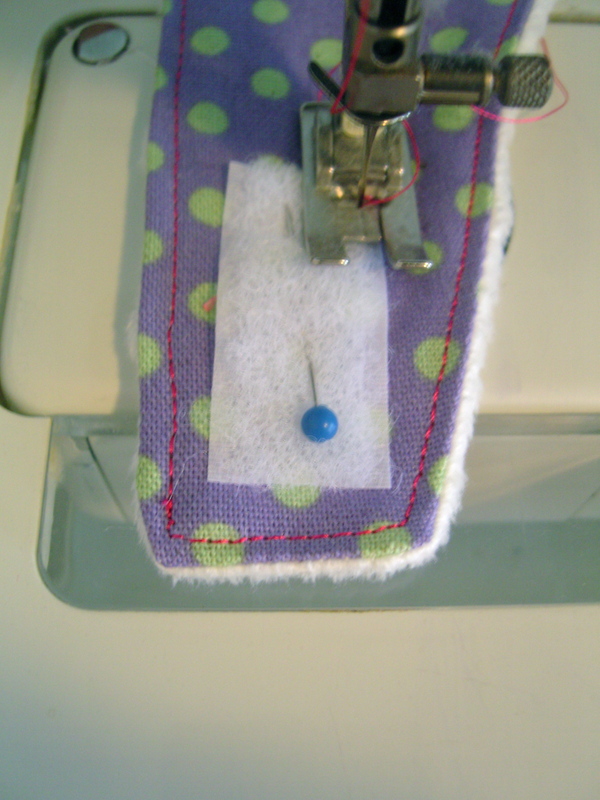 Start at your furthest coloured pin and sew until you reach the second coloured pin. I like to keep the stitch length quite long for this. All machines vary, but for mine this is around about 3. 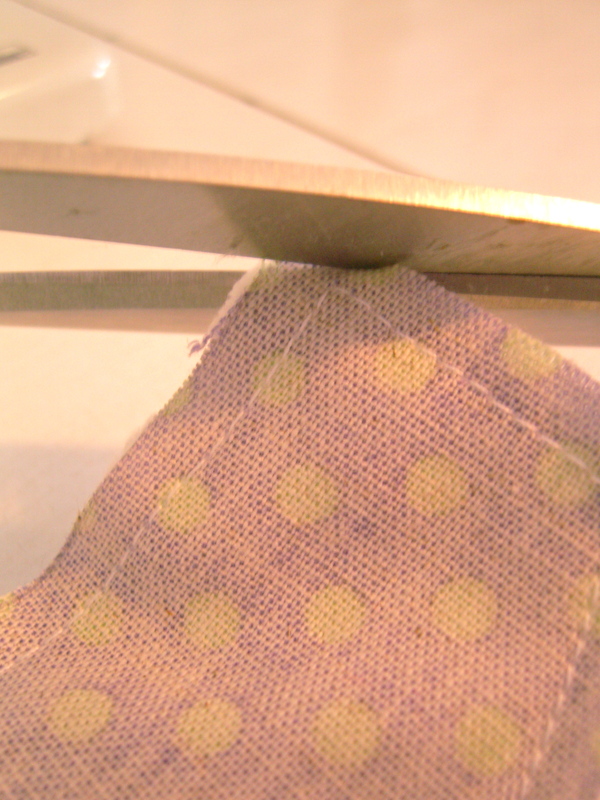 Before you turn it inside out, carefully snip the corners so that you get a nice crisp finish on the outside. 8. 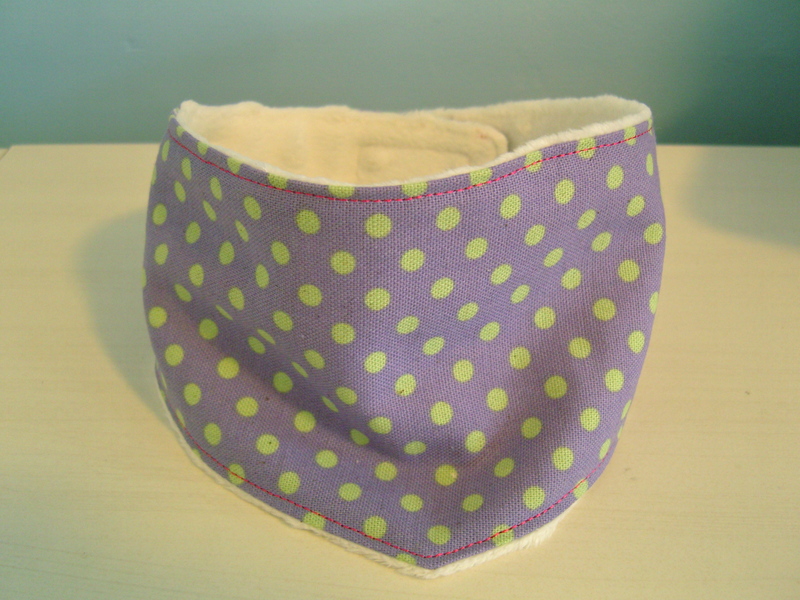 Unpin and turn inside out (or right sides out). 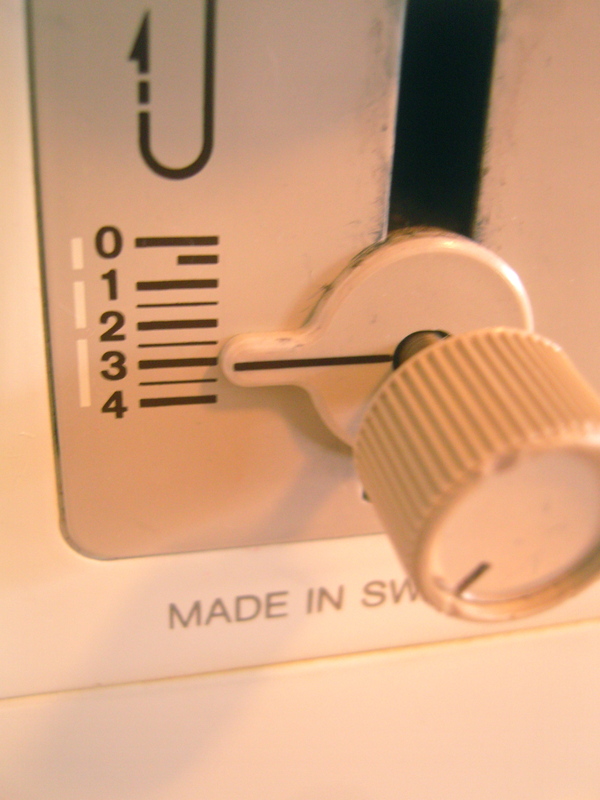 Use an unpicker or any of suitable tool to poke the corners right out. 9. At this point you’ll probably find that the fabric has crumpled a little so it’s a good time to iron it out and flatten all the seams. This will make for a much cleaner finish at the end. 10. 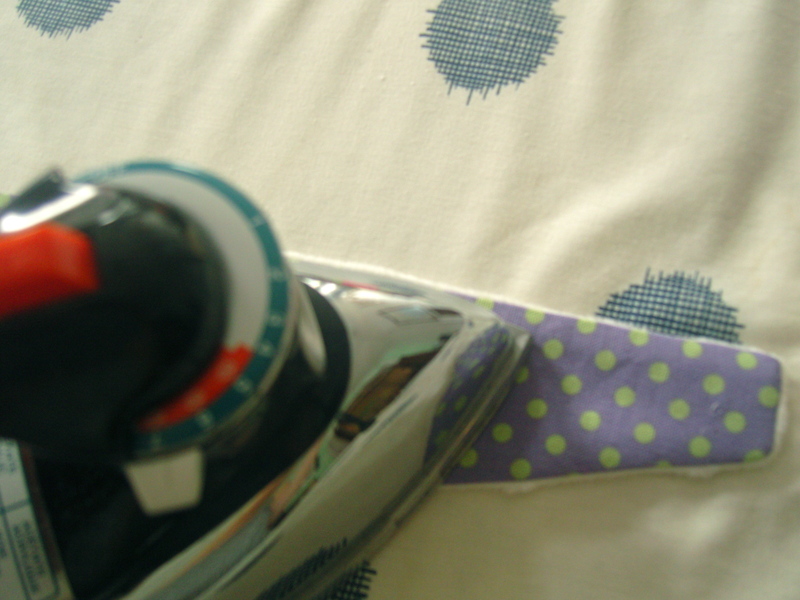 Using the iron (be careful!) iron under a hem on the entry. 12. 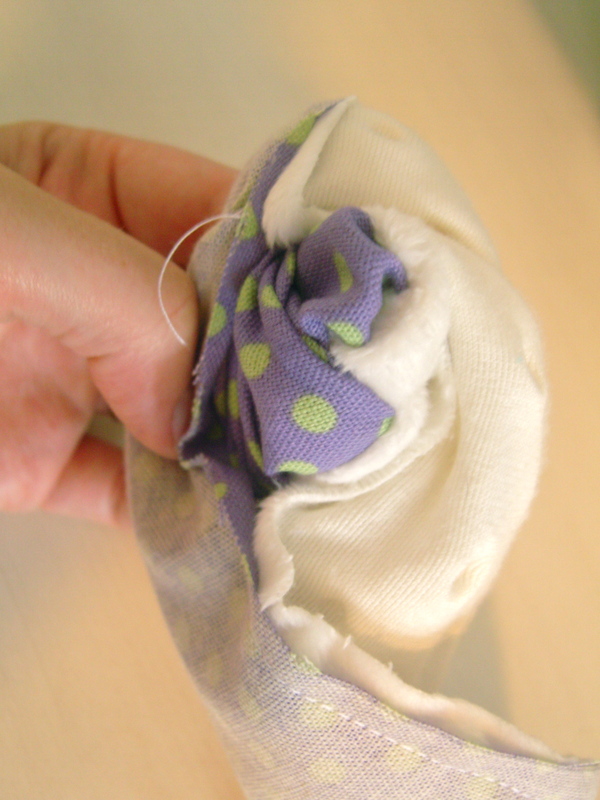 Sew all the way around. 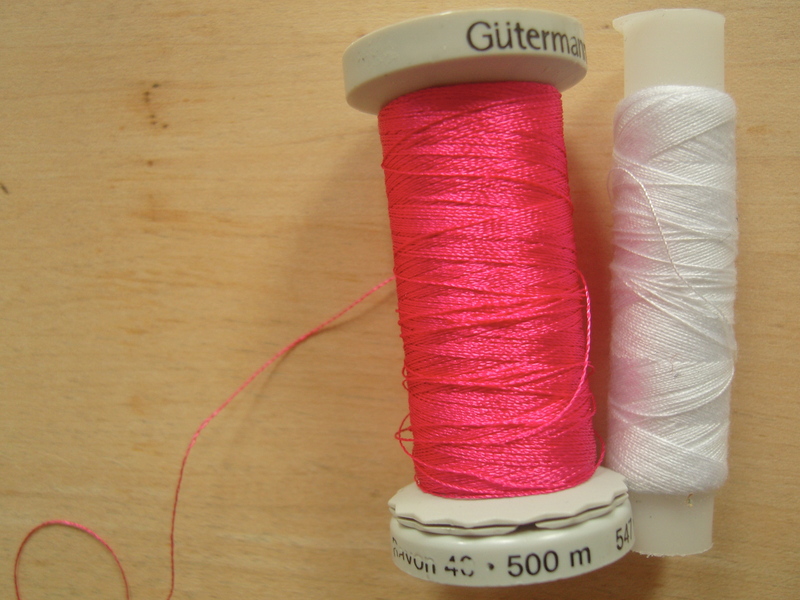 I like to use a contrasting thread, but it’s absolutely up to you. 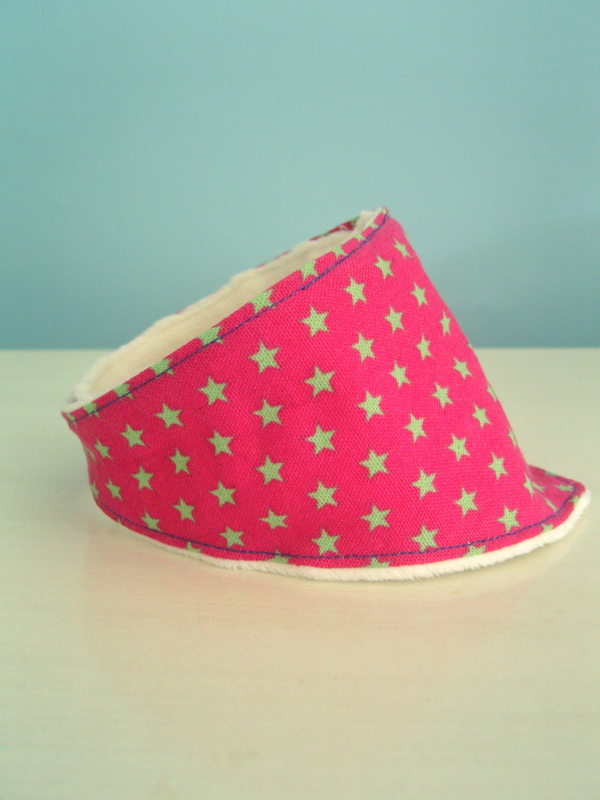 I kept the thread in the bobbin the same colour as the backing fabric as I wanted this to match. 13. Now to cut your velcro. 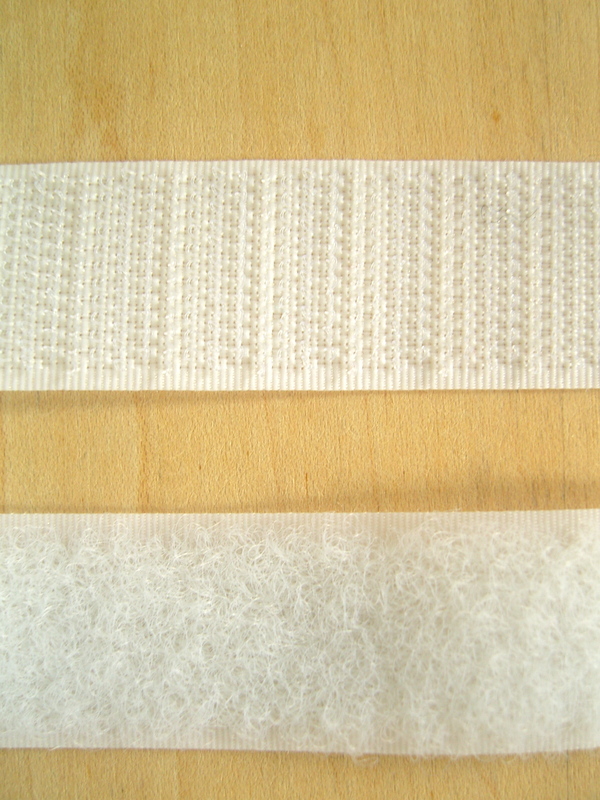 You’ll need to cut one from each side of the velcro, the soft side and the scratchy side. 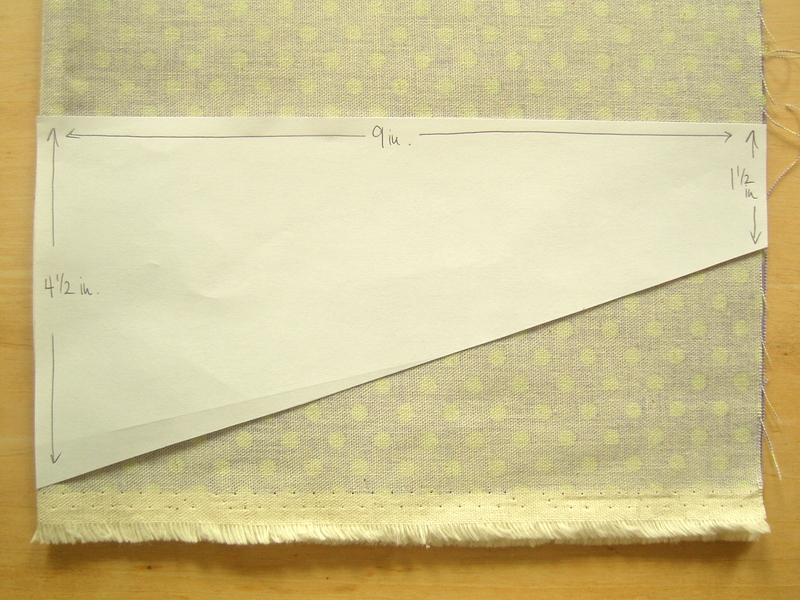 The picture below shows a rather large piece, but now that the pattern has been altered you’ll need a much smaller piece, approximately 3/4 inch. 14. Pin the velcro in place then sew it on. And hey presto! 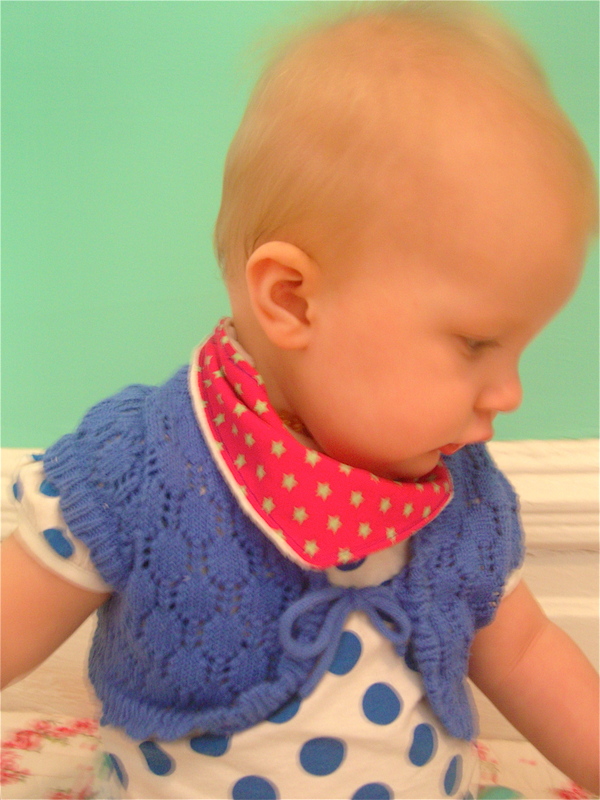 You’ve made a dribble catcher! Huzzah! 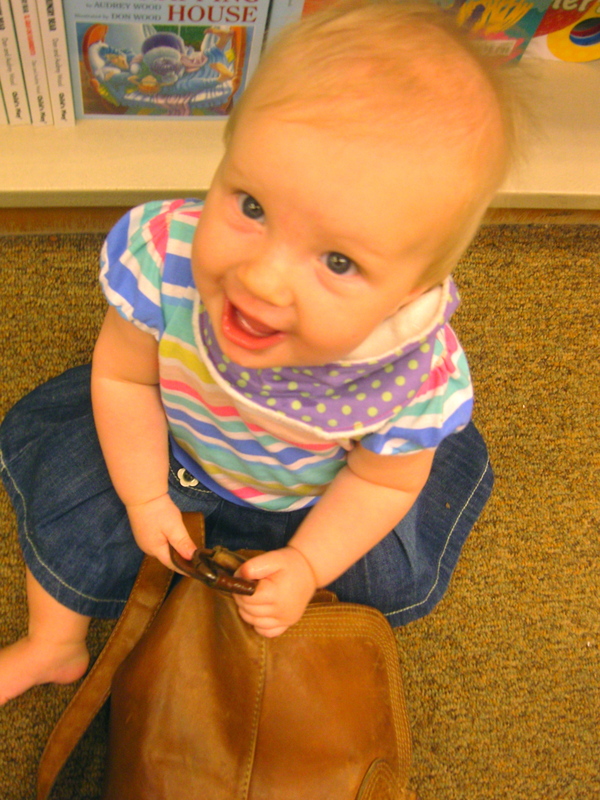 05 Oct	This entry was published on October 5, 2012 at 6:15 pm and is filed under Uncategorized. Bookmark the permalink. Follow any comments here with the RSS feed for this post.